On the football field, linebacker Dan Adams '07 was fast on his feet. At Holy Cross, he lead the NCAA in unassisted tackles in 2005 and set a record for most unassisted tackles in a game. But when Adams heads to the top of Africa's Mount Kilimanjaro this January, he will deliberately move at half the speed of typical climbers. That's because he's leading a team that is accompanying Kyle Maynard, 25, the author of the bestselling book No Excuses, on his attempt to become the first quadruple amputee to summit unassisted. The goal of what they're calling Mission Kilimanjaro is simple: to show children in particular that no matter what their physical restrictions, almost any goal is in reach with determination, hard work and faith. "Visually, Kyle has some startling physical limitations," Adams says of his friend Maynard, who despite being born without arms or legs competed against a fully able-bodied opponent in a mixed martial arts fight. That MMA match, and the training that led up to it, was chronicled in the 2010 documentary "A Fighting Chance." "What's cool about Kyle, and the thing many people don't understand, is the mindset he has," says Adams. "Kyle has a gift to accomplish any goal he sets out to achieve. The key ingredient is not letting the fear of failure or a perceived limitation sabotage the first attempt, something Kyle has had to fully grasp to master simple, daily tasks. If a person can apply this formula in their own lives, can you imagine the power? It has nothing to do with disability or altruism and everything to do with showcasing the power of the mind." Being the physical underdog is something the 5-foot-9-inch Adams understands. This relatively small athlete-at least when standing shoulder pad to shoulder pad with elite football players-was told again and again that he would never make it as a college linebacker, never mind at the competitive level of the Holy Cross team. "I'm not a small guy, but for the position I played I was tremendously undersized," says Adams, who went on to become a four-year letter winner at Holy Cross. "I believed I could accomplish whatever I put my mind to. I never missed a practice in college and was fortunate enough to accomplish some pretty amazing things over the course of my career." After graduation, Adams represented the United States in the 2007 IFAF (International Federation of American Football) World Championships in Japan. He competed on Spike TV's "Pros vs Joes" television show, where he laid out Pac-Man Jones on the goal line, forcing the NFL star to fumble the ball. "It all deals with mindset," Adams says. "Your physical build and stature play a role, but a very small role in comparison to your mindset and outlook." Which brings Adams back to why he quit his job with Sun Life Financial in Boston last April to dedicate himself-and a big chunk of his bank account-to Mission Kilimanjaro: "I enjoyed that job, but I had more of a calling to other things." Just five years after graduation from Holy Cross, the 26-year-old wanted to do something that combined his love of sports and competition with the Holy Cross calling to be a man for others. So when Adams' friend Blake Shubert (Villanova '07) suggested that they hike up Mount Kilimanjaro, the two came up with a plan to make an impact while making the climb. They immediately thought of Maynard, in part because they'd recently watched "A Fighting Chance." Adams flew to Atlanta last spring to meet Maynard in person and propose the history-making climb up the highest peak in Africa. Maynard agreed. "And that's when our adventure began," Adams says. The last nine months for Mission Kilimanjaro have been a whirlwind of training, fundraising and interviews with media outlets from the BBC to CNN. Adams wasn't intimidated by the fact that he didn't have much experience organizing such a big event; he simply charged down the proverbial field full of passion and determination. He helped design the website, www.MissionKilimanjaro.com. He networked with the founders of Crowdrise.com, including actor Edward Norton, to promote the fundraising efforts of Mission Kilimanjaro. He spent so much time at one Boston Apple store teaching himself how to best use technology to mobilize others to action that the store featured him on life-size displays to applaud his efforts. "You can take that mindset and apply it to anything you want to do," says Adams. "You can be a great violinist or writer; it's taking that first step and trying it. If you're willing, you can learn anything. That is one of the greatest things I learned at Holy Cross: You can listen to lectures from different classes, however the only way to find truth in your life is through applying the lessons to your direct life experience. I think liberal arts are so important because it gives you a great foundation to follow your own insights and make your own decisions. Every 1,000 miles starts with one step, and I am thankful to Holy Cross for giving me the confidence to trust my own inner voice." Of course, taking that first physical step up Africa's highest mountain is a challenge even for athletes like Adams. But for someone with Maynard's disabilities, it's uncharted territory. So to kick off Mission Kilimanjaro, Adams and Maynard flew to Colorado to climb and just see what would happen. "We took the first leap of faith," says Adams. 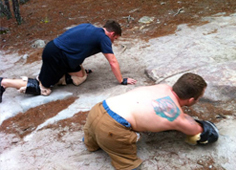 "There are people that use prosthetics to climb, but no reference guide we could use for this. It was our own system of trial and error." In fact, the night before their first climb together, they lacked equipment or even a solid plan. "We went to Safeway and picked up towels and tape, and the next day we wrapped up Kyle," he says. "But we were tremendously successful with something that simple. Kyle was able to get to 12,000 feet, and he was able to climb for six or seven hours on his own. We said, 'If we can do this, then we can move forward.'" They've since refined Kyle's climbing equipment, teaming up with orthopedic specialists in Arizona to make small improvements to their adaptive climbing system, which originally included chalk bags, guerilla tape, gel sleeves, and mountain bike tires. The January climb is fast approaching, and Mission Kilimanjaro is ready. In addition to Adams and Maynard, the team includes two military veterans who suffer both visible and invisible wounds of war. A few days before their ascent, Maynard and the team will be spending a day at a school in Tanzania for children with disabilities; they'll leave behind $25,000 in donated medical supplies. "My own philosophy is if you can create a vision and are willing to confront all the adversities and fears associated with it, those visions become realities," Adams says. "It's being willing to take the first steps and trusting the power within we all share to create the desired outcome. What would you pursue in your life if you we were unafraid to fail? In a time of economic and political uncertainty, it is our responsibility to take accountability and lead in our communities."